To elucidate the precise molecular mechanism(s) by which AT exerts anti-inflammatory activity, we examined the effect of AT on the endothelial production of PGI2 using cultured endothelial cells. However, AT did not directly increase endothelial production of PGI2 in cultured endothe-lial cells. Thus, the mechanism(s) by which AT promotes endothelial release of PGI2 in vivo might involve unknown factors other than endothelial cells. Figure 3 Regulation of the microcirculation by antithrombin. AT, antithrombin; TNF-a, tumor necrosis factor-a; CGRP, calci-tonin-gene related peptide; F. Xa, activated form of coagulation factor X; PGI2, prostacyclin. 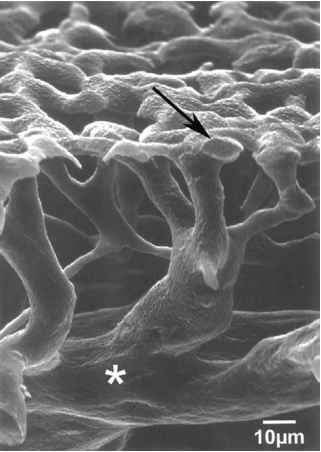 increase in microvascular permeability, leading to reduced blood flow resulting from local hemoconcentration. In addition to stasis, activated coagulation factors such as factor Xa are essential for development of venous thrombosis (Figure 3). 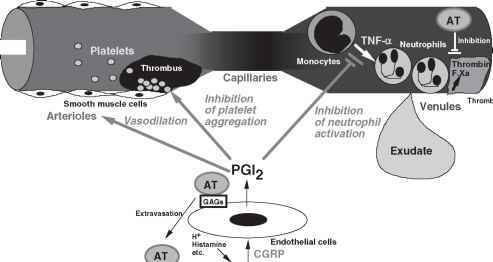 Thus, AT might prevent thrombus formation by promoting endothelial production of PGI2 in postcapillary venules where activated neutrophil-induced endothelial damage is frequently induced and also in veins by its inherent anticoagulant activity. Thus, both anti-inflammatory and anticoagulant activities of AT might contribute to the maintenance of proper microcirculation.